Ricoh’s new Interactive Whiteboard D5510 offers a number of improvements over its previous model. The new Ricoh interactive whiteboard will be introduced during InfoComm 2015. A new interactive whiteboard will allow collaboration with more than 160 onsite or remote users. Ricoh's new Interactive Whiteboard D5510 boasts several improvements over its DD5500 predecessor, including HD video playback and audio ports for speakers; new intelligent character recognition capability; intuitive nested commands arranged according to common workflows; and auto shapes like lines, arrows and stamps. Educators and students can create drawings, review designs, edit documents and share notes on a 55-inch diagonal HD screen that allows users to incorporate interactive content from PCs or thumb drives. Up to 168 participants can view images via a password-protected virtual private network. No software downloads, calibration or training is required. "There are virtually no more boundaries to collaboration, except the ones you want to enforce," said Ricoh Visual Communications Group Vice President Matt Sakauchi. An electronic pen is included with the whiteboard and any content that appears on the screen can be printed, e-mailed or saved. The suggested retail price for the Interactive Whiteboard D5510 is $7,140. An optional stand is $1,126 and a collaboration license is $1,200. 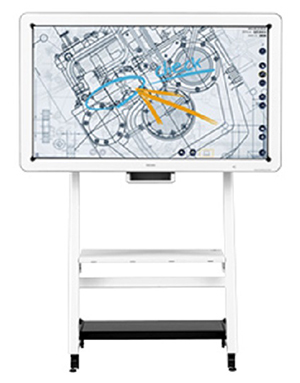 The whiteboard will be introduced and demonstrated for the first time at the InfoComm 2015, June 13-19 in Orlando.